Recession, shma-cession. New York City is booming with construction sites these days. Sure, they make just walking around into an obstacle course adventure, and yes, some of them are stalled, but hey, progress! In fact, there’s even more reason not to cringe at the cranes and diss the dumpsters: just think of them as public art. Starting last week, the Alliance for Downtown New York‘s Re:Construction project has been dressing up five sites around Lower Manhattan with work by artists like Katherine Daniels and Maya Barkai. 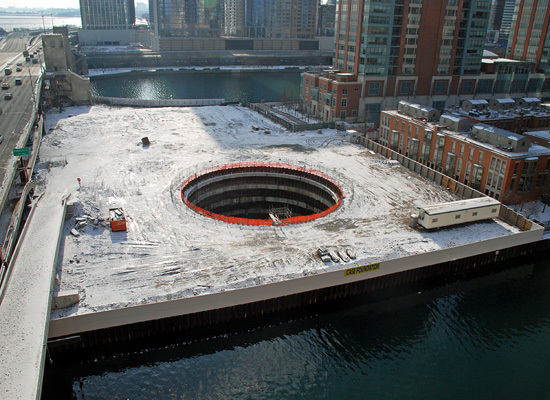 It’s a follow-up to the first phase of Re:Construction, started in 2007, which covered ten sites. Check out the new five at: the East River Waterfront Esplanade at South Street, 99 Church Street, West Thames Park in Battery Park City, Fiterman Hall at Manhattan Community College, and 56 Leonard Street. 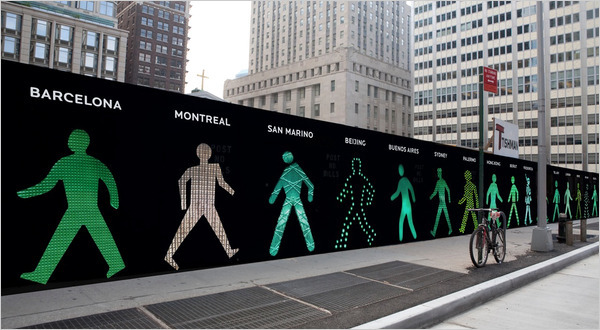 My favorite is Barkai’s: a 500-foot-long mural of 99 “walk” symbols from cities around the world, submitted by visitors to her Web site. It’s up at 99 Church St., the (stalled) future site of a Four Seasons hotel and condo. An ironic commentary on the diverted (or flat out closed) sidewalks that ring so many of these sites? Maybe. But at least it includes Ampelmännchen!